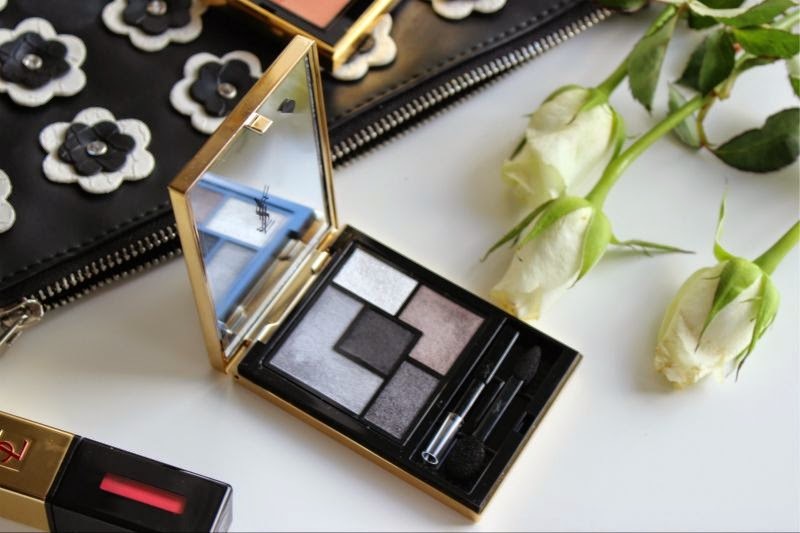 As you may be aware for Summer 2014 YSL Beauty will launch 8...yes 8 new eyeshadow palettes which launch this month. From bright almost neon pops of colour to everyday neutrals you can bet the brand has it covered. 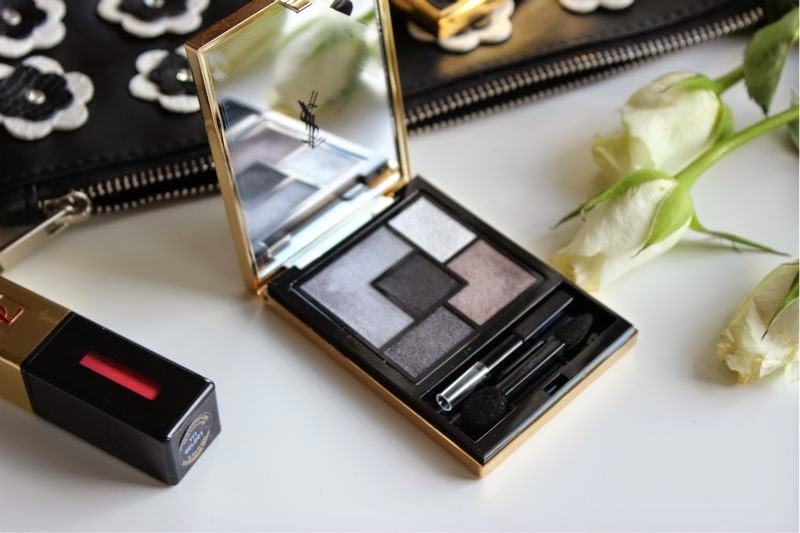 I was lucky enough to be sent a palette to put to the test YSL Couture Palette in 1 Tuxedo and will openly say now that if you are a fan of a smoky eye your collection undoubtedly needs this! A quick run down of the packaging - sleek, golden but oddly plastic in finish. It looks great, feels sturdy, has a good sized mirror and seems robust enough to cart around on a daily basis. 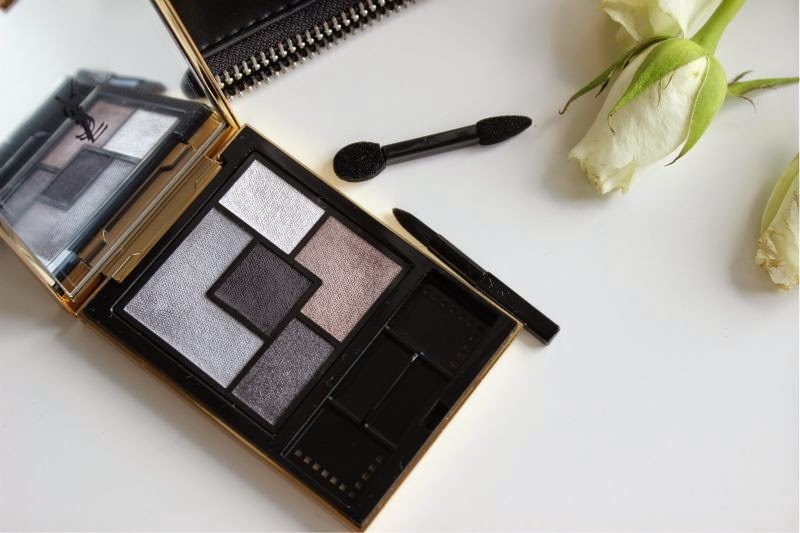 The new YSL Couture Palettes also come with two applicators - one duo ended foam sponge which I will be honest will go unused, as well as a fine pointed mini brush which is great for applying shadow/liner to the lower lash line. 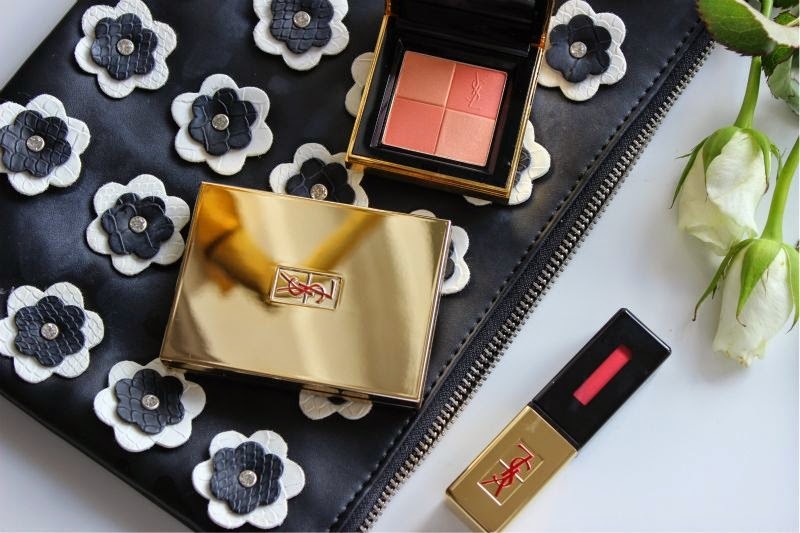 If you purchase a YSL Couture Palette be sure to keep said brush safe as it really does come in handy. So yes 8 new colour schemes to choose from all of which contain five eyeshadows - one of which is intended to be a base, another a highlight and three colours to line and define with. All of the intended shadow usages are marked on the back of the palettes box but as with any make-up product you use it how you see fit! 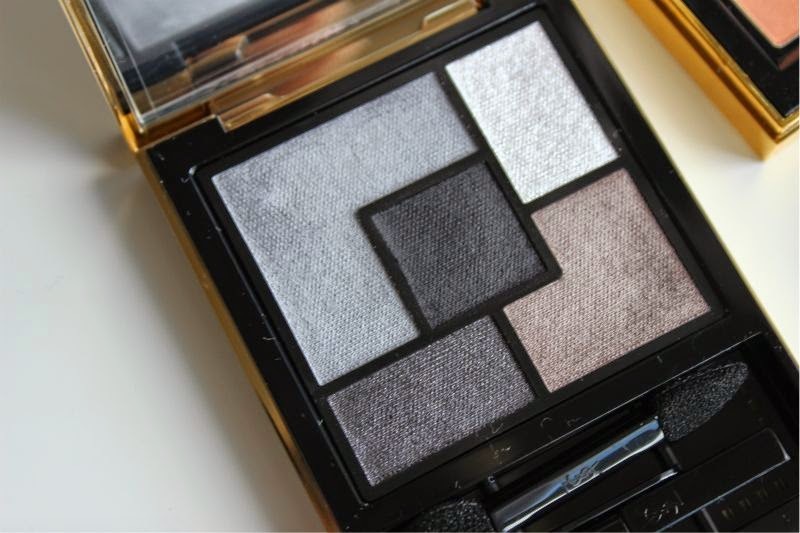 As earlier mentioned I have the deep and night ready colour schemed YSL Couture Palette in 1 Tuxedo - a cool toned medley of greys, a light mauve, a true matte black (this doubles up as a liner) and a shimmering white. I guess a more budget friendly version of this albeit with less eyeshadows would be Bourjois Smoky Eyes Eyeshadows in Gris Party. Nothing will sway me more into parting with cash than great pigmentation, I kid you not when I say that this has to be one of the best palettes I have come across in that aspect. There is not a weak shade out of the five on offer - each swatch is only one little swipe, the colour pay off is phenomenal. 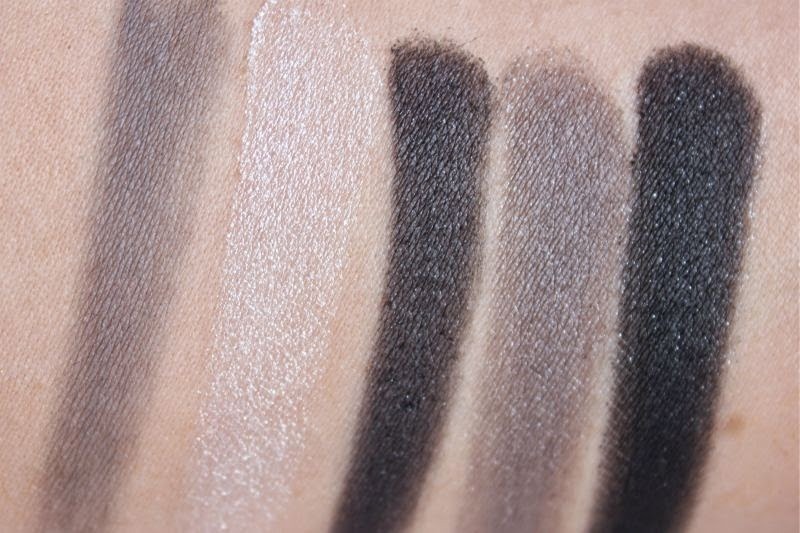 I do have to state that the texture is a little drier (I found this made the shadows adhere to my eyelids a little better) than I expected but oddly it doesn't produce an abundance of product fall out. I am beyond impressed. As you may know I have really oily skin which also extends to my eyelids so I do test all eyeshadows with a base and primer - recently in Glasgow the weather has been really humid resulting in powder products creasing a little quicker than usual and yet both times I used this palette I achieved 8 hours of wear. Although this particular palette was gifted to me I will be purchasing a neutral version for everyday wear as soon as I can get to a counter. 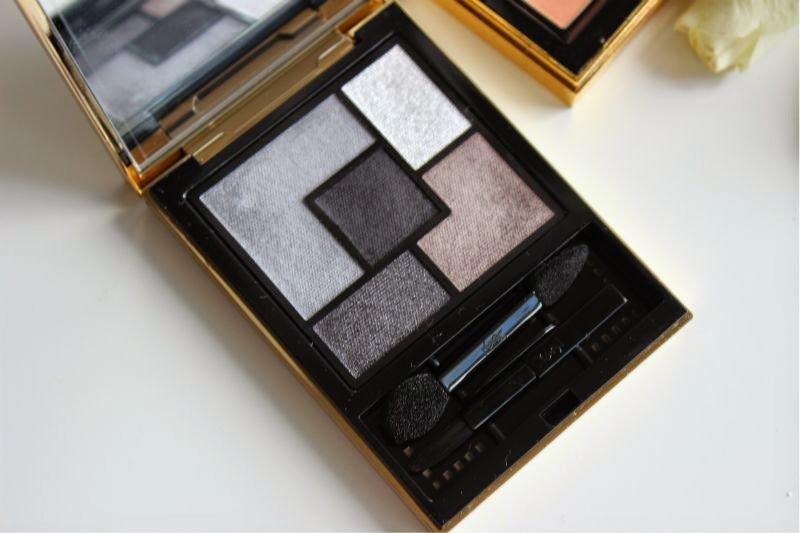 You can find the new YSL Couture Palettes via YSL here for £39.50 each. Love the shades in this palette! So chic!